Attachment: Removable Metal Shoulder/ Crossbody Strap. 【Feature Design】 This women clutch purse is studded with thousand of small solid rhinestones and beadeds on the front view. 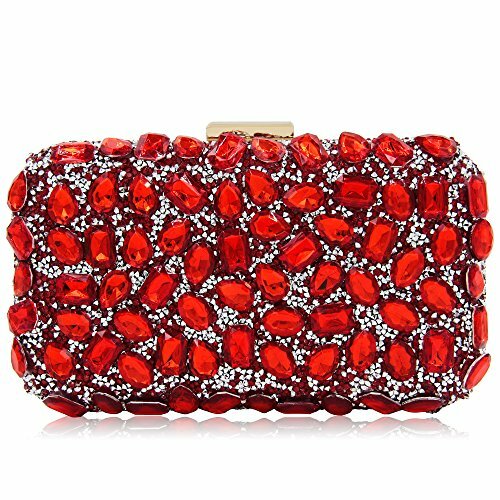 Besides, there are nearly hundred pieces sparking beaded diamonds on the clutch which shape inclues Square, Oval, and Water Drop. Back view of the evening bag is plain durable satin with soft touch. 【Main Materials】 Satin evening clutch with gold metal Frame. Besides, There are diamond beadeds and multicoloured rhinestones decorated on it. Top durable metal clasp closure keep it strong and safty. 【Interior Capicity】 7.9 x 2.4 x 5.1 inches. Net weight is about 1 pounds.it is available to fit in the size of cellphone like iphone8, and other mini cosmetics, cards. 【Chain Strap】 With one long metal removable chain Strap (length in 47 inches). It can be attached on the metal hooks inside the clutch purse. Not only used as hand clutch, but aslo a shoulder bag or crossbody bag in usual. 【Styles And Occasion】Wedding evening bag, Bridal clutch purses for women, casual shoulder bag.PERFECT DESIGN FOR Wedding, Party, Cocktail Ceremony, Daily, Dating. YOU WILL GET A LOT OF COMPLIMENT.